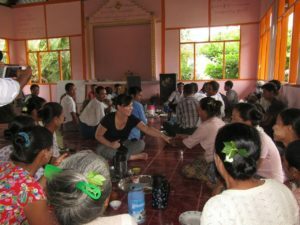 As Burma Country Coordinator, Emiko Guthe managed Tenure and Global Climate Change (TGCC) project Burma pilot activities by helping to coordinate participatory mapping efforts, which documented community land resources in eight locations. A GIS specialist by training, Guthe brought her experience supporting mapping efforts to many international development projects in Burma. Tell us about a little about Burma and USAID’s land tenure work there. Burma is currently experiencing very rapid economic transformation, which poses both risks for the environment, as well as economic opportunities for the country’s diverse population. Land and natural resources are at the center of change, but the legal framework that governs land administration in Burma is complex, confusing and politically sensitive. Unclear laws and policies translate on the ground to a lack of clarity in roles and responsibility for land governance. Land administration is non-transparent and has not historically incorporated the perspectives of local communities. USAID’s Tenure and Global Climate Change project in Burma, called the Land Tenure Project (LTP), began in 2014 to initiate steps toward a more sustainable land management system in support of equitable economic development. Underpinning all activities are principles of inclusive, public participation to encourage transparent and evidence-based dialogue amongst government, rural communities and civil society. Working on legal change as well as with rural communities, USAID tested and modeled participatory processes with many stakeholders in country. In a nascent democracy, USAID demonstrated the value of including diverse perspectives for policy development and land related decision making processes. By encouraging dialogue amongst interested parties, stakeholders gain the skills and experience to develop sound laws and policies, negotiate conflicts around land and understand their rights. By training local organizations to address land-related challenges, they gain key capabilities to help communities on a path toward economic prosperity. USAID’s TGCC Burma program supported development of Burma’s new National Land Use Policy, which utilized an unprecedented process of public consultation to adopt international good practices. Endorsed by the government in 2016, the policy lays the groundwork for more sustainable land management and promotes people centered development around participatory decision making. The project also tested the National Land Use Policy in practice at eight pilot sites in four states and regions of Burma. These pilots tested participatory mapping approaches that document community land resources. Local partner teams produced village resource boundary and land use maps for 59 villages and established 52 community representative committees. To ensure that the new and current legislation was known both to government and constituents, we held legal awareness training seminars at different sites. Overall, we met with over 600 local government authorities in 15 village tracts and helped to improve their understanding of roles and responsibilities under the current legal framework for land. What were the key learnings? Complex and confusing laws and policies govern land in Burma and this translates to government roles and responsibilities that are not clear for communities. There is a strong need to harmonize and streamline the land legal framework. Communities, especially rural villages, lack access to accurate, up-to-date information about their land rights. Traditionally, communities have had very little interaction with local authorities and do not look to government as service providers. Civil society groups often fill this void, but non-transparent land administration systems make access to information and data difficult. Communities need awareness raising and guidance on how to navigate a complicated land governance system. Mapping initiatives in Burma are historically opaque, mandated from top levels of government, and rarely, if ever, take into account community knowledge or perspectives. The government needs support to integrate participatory approaches into mapping and resource documentation initiatives. What else should people know about this work? Burma is at a very early stage in developing sustainable land management systems and there is huge demand for this work!